1. 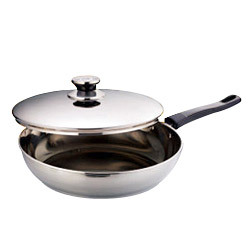 Product name: stainless steel pan. 1. Diameter: Ø 30cm. 2. Thickness of steel plate: 0.7 m/m. 3. Single packing (color box). (1) Q'ty: 1 set. (2) N.W. : 1.75 kgs. (3) G.W. : 2.1 kgs. (4) Meas: 480 x 330 x 105 m/m. (5) Cuft: 1.0'.